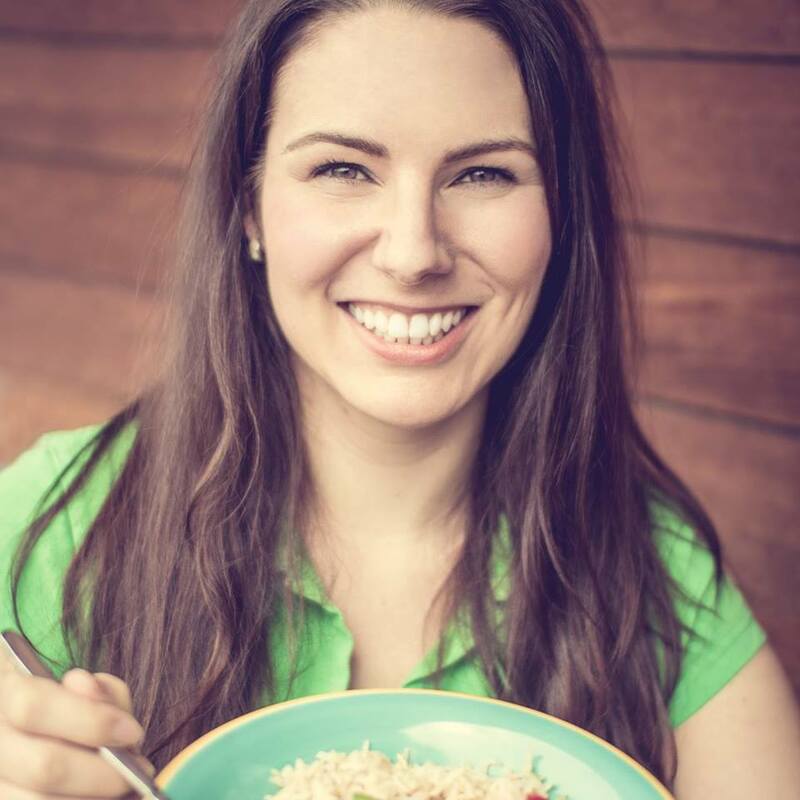 Meet Eva Burg, Nutrition Coach and award-winning food blogger. She has proven that healthier recipes can be manageable and delicious. When In Good Company launched on twitter, I almost immediately bumped into one of the most impressive food bloggers – @TheHealthyTart. I was instantly drawn into her well-informed descriptions of the nutrients in her mostly vegan recipes – and I can honestly say that I’ve never been the least bit tempted to even consider eating, much less cooking a vegan recipe- until now. I’m not particularly driven to reduce the amount of sugar, gluten, or dairy in my diet – HOWEVER – what hooked me are the creative ways that The Healthy Tart uses foods that I love, like avocados, cocoa powder, assorted fruits, nuts, berries, grains, and a wide variety of vegetables – and sources of protein that I’ve never even heard of. Besides, who couldn’t afford to drop a few points off of their cholesterol? Or find a wide variety of healthy snacks? Or make a meat-free meal – just because it’s absolutely delicious? See where I’m going with this? You don’t need to be a vegan to enjoy the recipes on this award-winning, easy-to-follow site: www.TheHealthyTart.com. Before I start to get hungry – the great news is – I’ve connected with The Healthy Tart herself, Eva Burg, and she has graciously accepted our request for an interview. 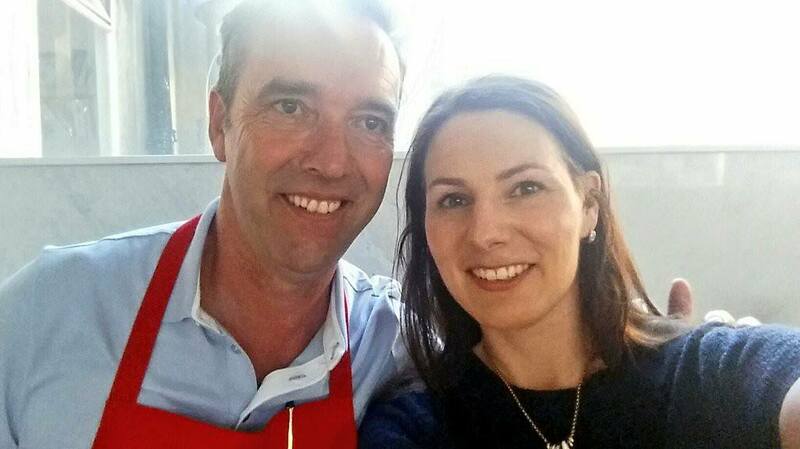 In Good Company: Greetings Eva! Thank you for chatting with us all the way from lovely Dublin. You mention on your website that a few years back you needed to make some changes to your diet and lifestyle. Part of your cure involved a move to Dublin and a whole-foods diet. What sparked your move to Dublin? Is there a strong whole-foods community there? The Healthy Tart: Thank you for reaching out. After two years of blogging I am still so very grateful for every single person I can inspire to try a healthier lifestyle. I love sharing my passion for a nutritious whole-foods based diet. My move from Germany to Dublin, funnily enough, wasn’t at all inspired by food. At the time, I was going through a bit of a rough patch in my life. I wasn’t in a good place mentally nor physically. I was longing for change and had dreamed about moving to New Zealand for many years, but it was very difficult to obtain a permanent visa. Instead, I decided to go on a holiday to Dublin and fell in love with the country and its people. At this stage, I had undergone a multitude of antibiotic treatments which had eradicated my good gut bacteria and left me with severe Candida overgrowth. Even though I didn’t consider my lifestyle as extremely unhealthy, my food choices weren’t as well-informed as they are today. When all the conventional medical treatments failed me, I started to look for alternatives. It was my GP who suggested cutting out most carbs and sugars and to supplement with probiotics and natural antifungals. Trying to eat sugar-free and low carb was a real challenge for me and I will admit that I shed some tears out of sheer desperation. Five years ago, there wasn’t a strong whole-foods community in Dublin, but things have changed drastically. Many people weren’t aware of the quality of the amazing food produced in Ireland but now “produced in Ireland” has become a synonym for quality. Nowadays, there are more and more healthy restaurants, health food shops and artisan food producers opening every day. The increase in organic produce sales in Ireland is among the highest in Europe. 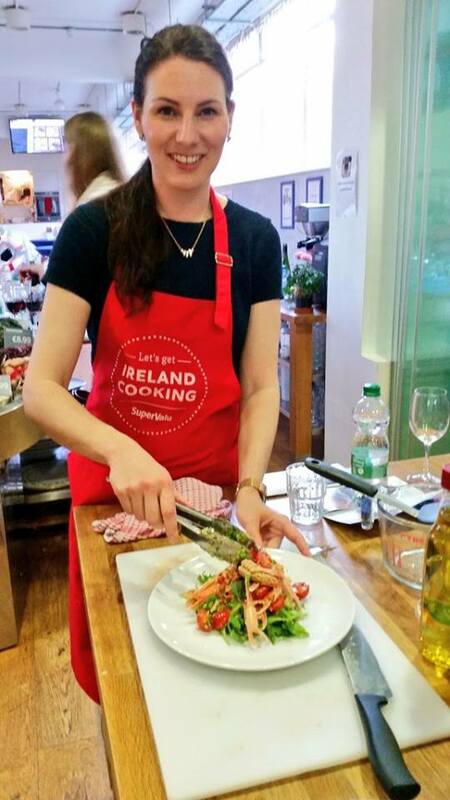 Photo: The Healthy Tart, Eva Burg, at Let’s Get Ireland Cooking, a SuperValu event. In Good Company: You describe that adding yoga and meditation (just a few minutes in the morning) in addition to your dietary changes gave you a surprisingly strong surge in energy in fairly short order. How did you first get into meditation in particular? It seems that meditation is a bit intimidating compared to trying a new exercise, for example. The Healthy Tart: Oh, it certainly felt intimidating to me. Even though my symptoms had improved massively it just seemed like I just couldn’t get rid of it completely. I felt constantly stressed and struggled to focus. Someone told me to try a meditation app called Headspace and I decided to give it a go. It offers meditations lessons for beginners and advanced people, you decide how long you want your lesson to be. At the beginning, I struggled to stay focused and not to think about my to-do list. But I decided to stick with it and to do it every morning even if it was only for 10 minutes. It took me about a week until I felt like it was getting easier. I even set up notifications on my phone to remind me to pause and be mindful and present. The app guides you in a very easily understandable way and explains different techniques. In the past, when I talked to people about meditation I was often told that it is the art of thinking about nothing. I quickly realized that this is not going to happen unless you are dead, instead, I started looking at my thoughts as clouds, they appear, and I watch them pass. It was a learning process, but I felt that it deeply relaxed me and changed my attitude towards my day. If I can do it everybody can. In Good Company: Now that you have “graduated” to an 80% plant-based diet, what do you think would surprise people about these types of eating habits? Is it easier/harder than you may have thought? What has been most helpful in helping you adopt new foods and recipes? Was studying nutrition the key to this transition? The Healthy Tart: A lot of people think that I am vegan which I am not. I have nothing against a vegan diet and it is certainly possible to get all required nutrients if you know what you are doing but at the moment it’s just not for me. I come from a family where we ate meat almost every day and vegetables and salads were considered to be side dishes. It would be a lie if I said that it came naturally to me, I liked vegetarian dishes, but I had a repertoire of about 3 meals which isn’t a whole lot as you can imagine. I went to the nearest bookstore and bought lots of vegetarian and vegan cookbooks. For the first couple of months, I only followed those recipes and became jealous of my boyfriend’s ability to chuck a couple of things into a pot and make it taste great without using a recipe. That’s when I decided that I needed to brush up on my cooking skills. It surprised me how much my palate changed in only a matter of weeks and all cravings disappeared. When I stopped eating sugar for a while all the other flavours seemed to intensify and regular sweets just became unbearably sweet. After eating sugar-free for 3 months I reintroduced small amounts of natural sweeteners which I stick with until today. Vegetarian and vegan dishes also tend to use lots more spices and I felt like a whole new world was opening up to me. I was amazed by the versatility of this new way of cooking and started to create a vegetarian version of my favourite dishes. Then I visited vegetarian restaurants and tried to recreate their dishes which helped me to hone my own creativity. When I go to the farmers market once a week, I always try to pick up something I have never tried before and incorporate it into a dish. This week I picked up kalelettes, have you ever heard of those? They are a mix between kale and Brussel sprouts and they are simply delicious. Nowadays there is so much information and recipes available online that it has become very accessible. When I decided to share my own journey on my blog I was aware that besides the tonnes of great information that there is also a lot of misinformation out there. I wanted to make sure that I wouldn’t be sharing fads and diet crazes, that’s why I decided to become a qualified Nutrition and Health Coach. Now I help people with a practical approach to improve their food and lifestyle choices so that they can be their happiest and healthiest self. 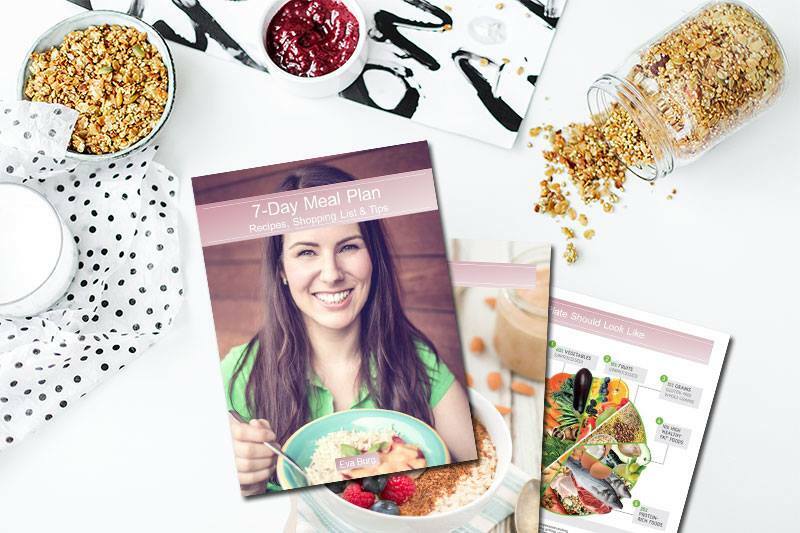 At the minute, you can download a free 7-Day meal plan on my website including lots of healthy eating tips. Every change takes a little bit of time and it’s not as complicated as it might seem. The trick is to keep thinking about all the new things you can eat and not about what you shouldn’t eat. A wholefoods-based diet is not restrictive, you simply cut out processed food, not entire food groups. If you cook from scratch and adapt meal prepping, it’s also not expensive. It only gets expensive if you rely on prepacked foods and so-called superfoods that come in little bags with massive price tags. There is no need to waste your money on a single packed cauliflower steak when the entire cauliflower head would cost just a fraction. If you feel like you can’t do it on your own get in touch with a Nutritional Therapist or Nutrition and Health Coach like myself to get some guidance. In Good Company: As I mentioned, it’s incredibly motivational that you describe the nutritional benefits of the foods in your recipes. It often makes we say, “Wow, what a delicious way to get my vitamins and minerals!” Has that been your experience as well? Does the pure enjoyment of the flavors keep you motivated to find new recipes? The Healthy Tart: People are usually very surprised to find out how much goodness hides in the humblest foods and that is why I like sharing this information. But I don’t want people to be thinking of food in numbers and nutrients because it would take away from the enjoyment. Eat a dish because you enjoy its taste and not because of its amount of nutrients. If you “eat the rainbow” in most of your meals you can be pretty confident to get all the nutrients you need. It’s my love for food and my readers who keep inspiring me to create new recipes. It makes my day when somebody uses my recipes and shares the result with me on social media by using #thehealthytart. In Good Company: I understand that despite all of the excellent, quality content and tempting social media posts, The Healthy Tart is something you do during your “off” hours. With your full-time job as a digital marketer, how do you make time for The Healthy Tart so consistently? Does it involve a lot of late nights and weekends? The Healthy Tart: It certainly does, but I enjoy it because it is something I am passionate about. Sometimes I need little reminders from my partner to take time off and he is absolutely right. When I get into something I can become quite OCD because I want to learn everything at once. Improving my life-work balance and exercising more are on the top of the list of my new year’s resolutions. In Good Company: I’d like to highly recommend that people visit your online properties, including your social channels, and be sure to download your free, 7-day meal plan –which includes shopping lists. In the meantime, which winter recipe shall we leave our readers with? 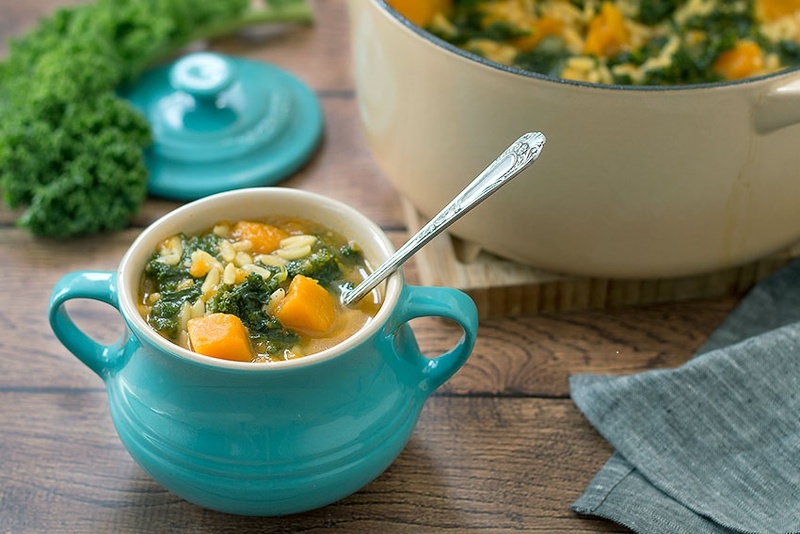 The Healthy Tart: This healthy, vegan kale and pumpkin soup with orzo is the perfect soup for the colder winter months. It’s warming and packed with nutrients. In a large pot, heat the extra virgin olive oil and add in the onions, sauté for about two minutes. Add the garlic and cook for another minute, don’t leave it much longer or it will become bitter. Cut ¾ quarter of the pumpkin into 1-inch dice and finely chop the remaining quarter. Tip the finely chopped pumpkin together with the thyme into the pan and cook for about 3 minutes, this will give the soup a nicer texture. Keep the1-inch-sized cubes for later. Add remaining pumpkin and simmer for another 15-20 minutes or until the pumpkin has become soft. For the last 2 minutes add the kale and red wine vinegar, this way it will stay slightly crunchy. Before serving tip in the cooked orzo pasta and enjoy. If you want to make this recipe gluten-free you can substitute the orzo pasta with puy lentils. In Good Company: You are in good company with Eva Burg, The Healthy Tart! 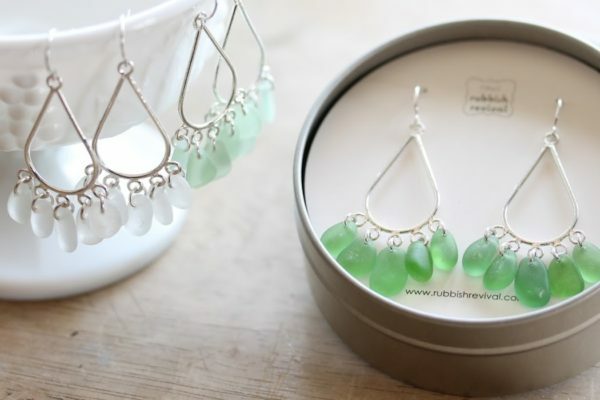 I am now a fan of Eva’s and will be following her on her blog. My family is originally from Ireland and I am a foodie so this article resonates with me. I love her idea of picking out a new veggie at the Farmer’s Market weekly. I get stuck in a rut with choosing the same every time, so this gives me motivation to explore new options. I love health and wellness and enjoyed this article immensely! and thank you for the recipe! We’re glad you enjoyed the article Chris! We think Eva is a great expert resource!